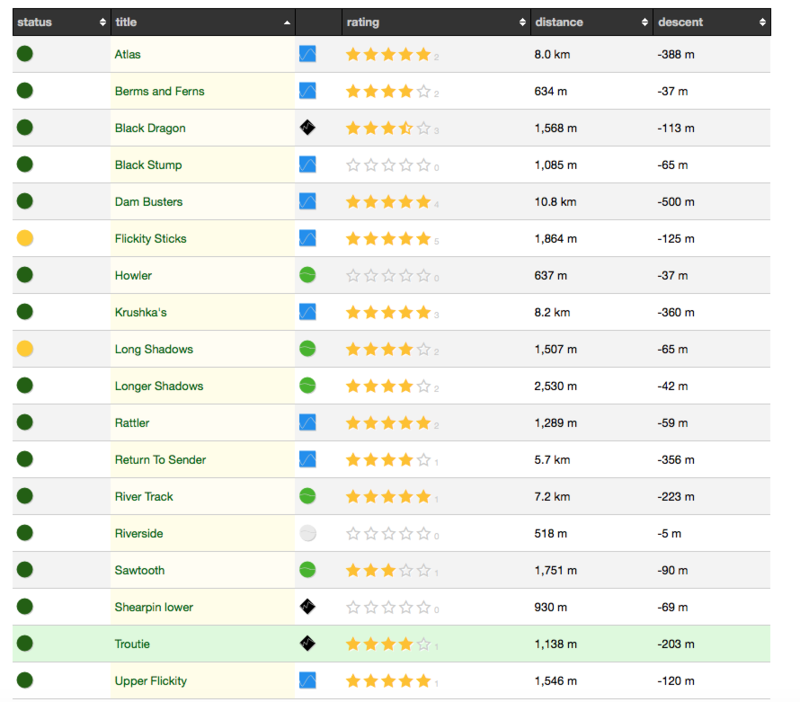 Individual Trail information starts half way down this page! Below Crank It Cafe you will find the primary trail head. Primary trail head has showers (3 x $1) and toilets, a bike wash and heaps of parking. It also has a water tank for drinking water. The camp ground near the tennis courts now has showers ($4 for 4 minutes) plus toilets. 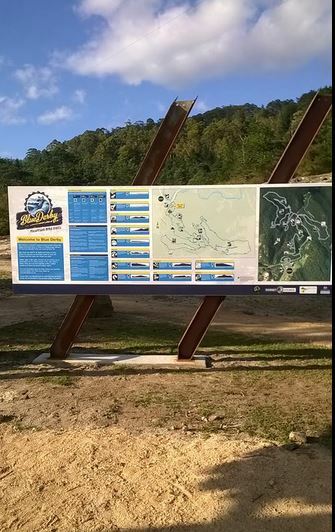 The first 20km-ish of trail build by World Trail opened on the 7 February 2015 and provides purpose built mountain bike singletrack. The next 10 km opened on the April 24 2015 and include's the iconic Dambusters trail. October 2015 saw the opening of Atlas, a shuttleable descent. 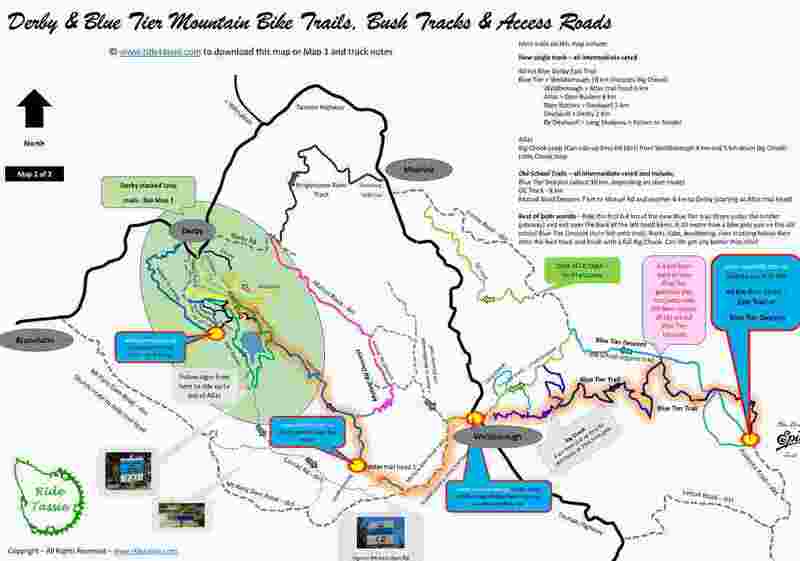 In October 2016 the iconic 18km Blue Tier Trail opened, acclaimed by one and all as one of the best wilderness trails in the world. 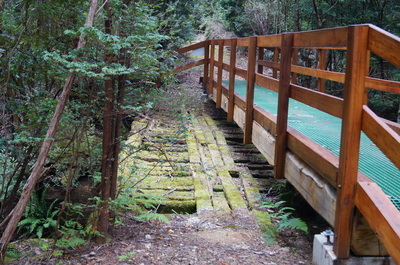 The secondary trail head is through town and near the bridge. No toilets at secondary trail head but has maps, ride routes and seating. Drinking Water - Yes OK and there is now a drinking water tank near toilets / shower facility. DO NOT DRINK water from creeks or streams! Trail Signage - yes - fan-bloody-tastic. Throughout the trails - everywhere! Trail Maps - yes, but ours are better! Maps - Yes, at secondary trail head. 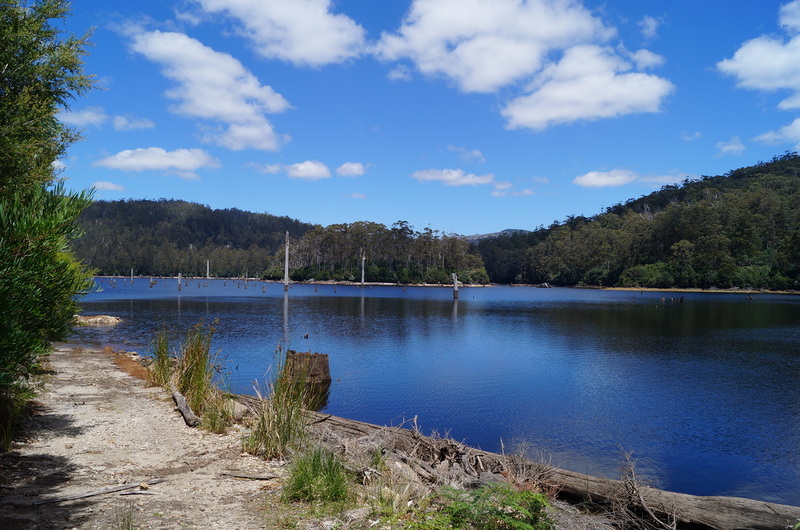 Vodafone - get a Telstra prepaid for your Tassie trip! Not sure where the trails start? Good question. From the secondary trail head signs (see right image) head due south. You want to get on the trail Rusty Crusty and turn right onto Axehead. 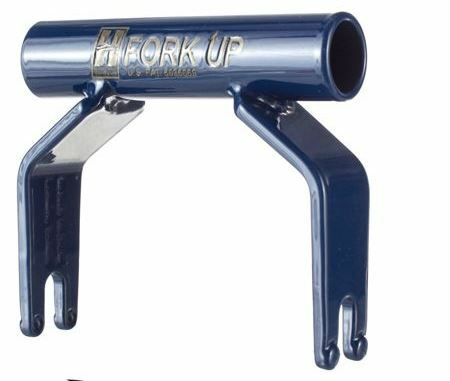 This will get you up to Devilwolf where most of the trails intersect. 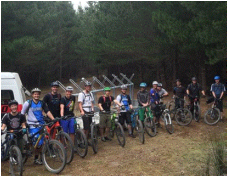 Note - To get up to the main trails, ride up Rusty Crusty and right onto Axehead. Departs from the secondary trailhead and climbs gently along the western bank of the Cascade River before crossing over the river and descending back to the trailhead. 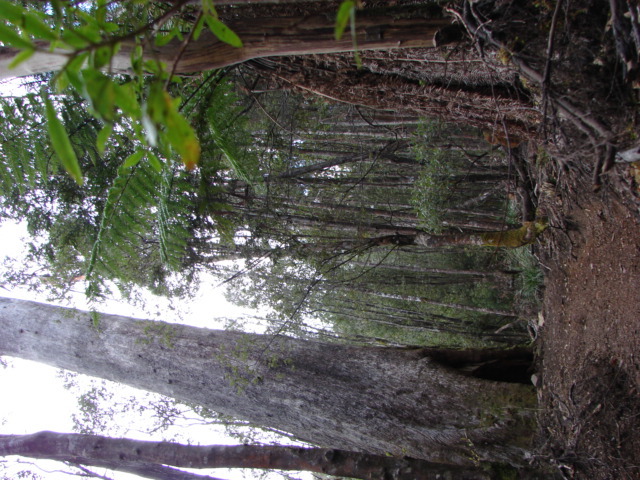 This trail provides a number of interesting granite slab features, as well as passing through the entrance of a disused tunnel that was constructed during the tin mining boom. The undulating and predominantly descending trail follows the eastern banks of the Cascade River. 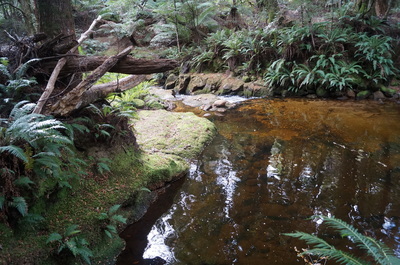 Begins on the western bank of the Cascade River and is accessed via Rusty Crusty (see above). Climbing gently, this trail provides access to the Major Trail Junction (to Devilwolf) and spectacular views of a wide, open granite valley. Riders will then have the option to access other trails from here before rejoining Trail 1 near the tunnel entrance. Long Shadows is a smooth & gentle 1.5 km climb to help you get to the top of Flickity Sticks (see below). This trail suits beginners, as does Flickity Sticks. 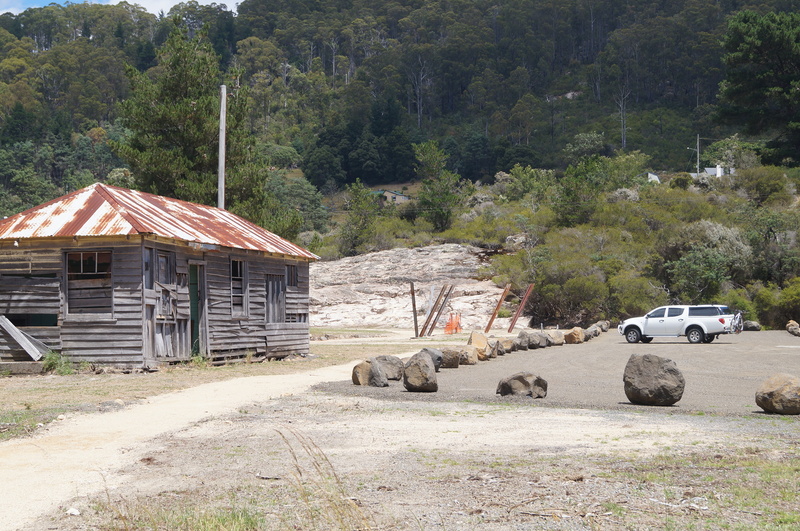 Much of the trail follows the old mining water races, as it follow the contours of the hill side. 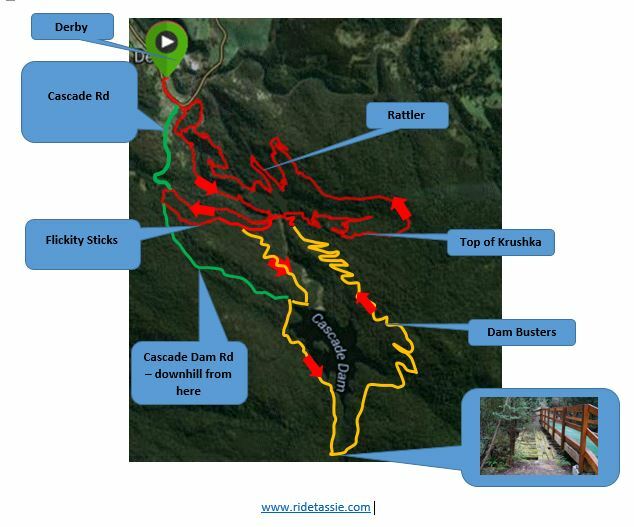 Flickity Sticks is an awesome little trail to get your body in tune with your bike and a great introduction to the trails. 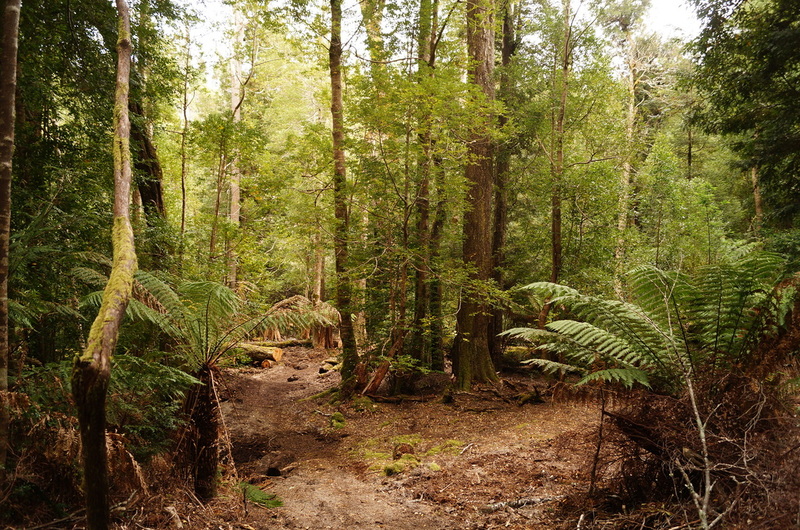 This is a 1.8 km descent that at first follows a mining water race and then goes down. It has great flow and meanders through the forest at a gentle rate. 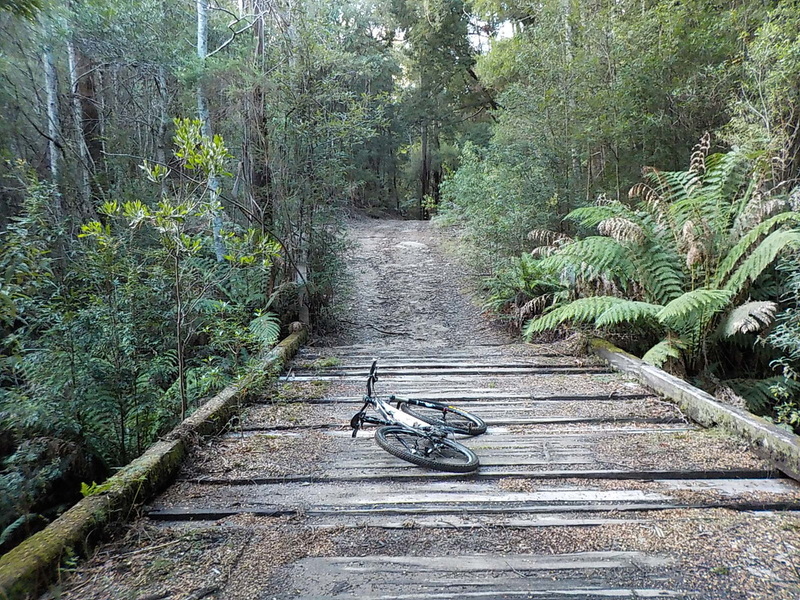 If ridden fast, it comes a little bit tricky, as the designers of the trail wanted. Most want to do it agian, straight away and if you have time, it's a great idea..
You can also self shuttle to the top of Flickity Sticks if you feel the need. 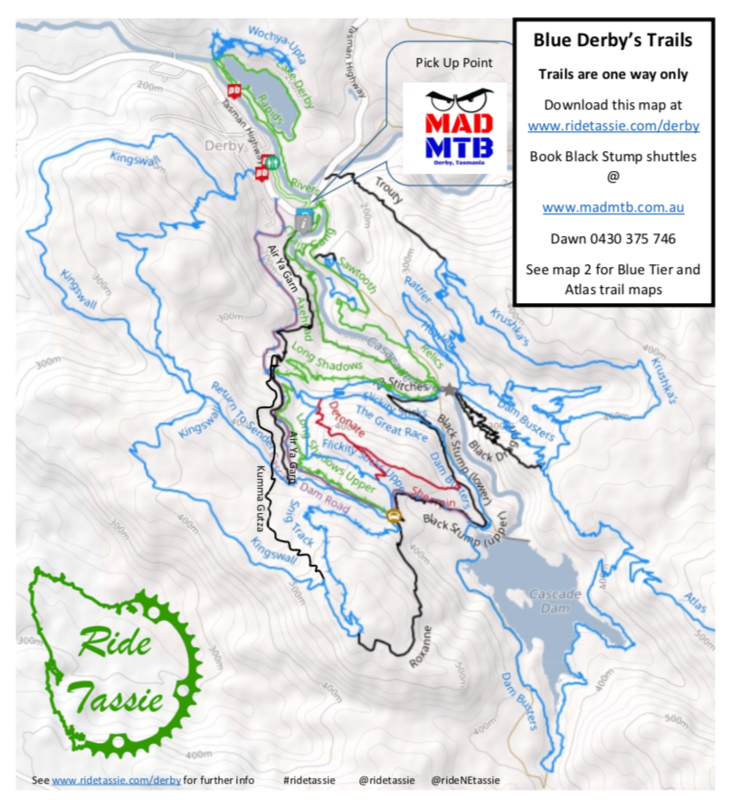 Trail Rating: blue - with a bit of climbing! 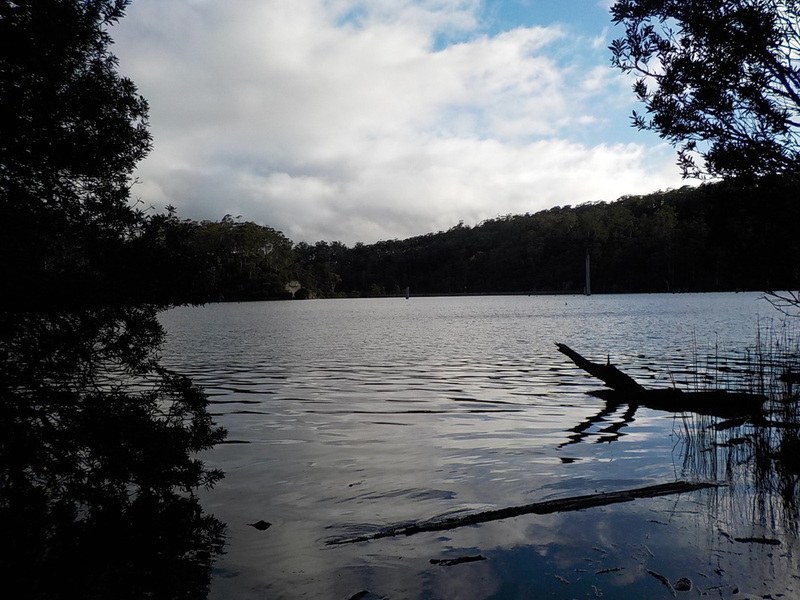 This trail has spectacular views of the Cascade River, Ringarooma River, Mutual Valley and the township of Derby. You require some fitness to ride this trai as the first 30 minutes is up. It incorporates climbing sections designed to gain altitude with a bit of effort and descents that provide a roller coaster sensation. Natural rock features appear abundant throughout. Dam Busters is one of the most popular 'cross country' trails at Derby. Its a great trail it you have progressed from beginner and have some fitness, although you can do a self shuttle (see map below). This is a great option if you don't have the fitness but want to enjoy the best of what Derby has to offer. You can access Dam Busters 2 ways. 1. Axe Head > Long Shadow > and turn off 1/3 of way down Flickity Sticks. 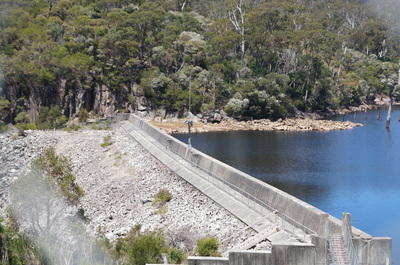 you then climb up Heartbreak Hill to the Cascade Dam Road. 2. Ride up Cascade Dam Road, with is just past the Federal Tavern. (This option is quicker and general easier. First 1 km is sealed and then it turns to dirt. As you past the Flickity Sticks trail junction, the road gets a little rough, but not too bad. If you go this way, it avoids Heart Break Hill and comes out near dam. See sign post at this junction. The remainder of the trail is single track, which circumnavigates the Cascade Dam. It provides spectacular views of the stunning Cascade River valley. It has a 2 main climbs, which require a bit of efforts. Be sure to stop and get a heap of selfies! 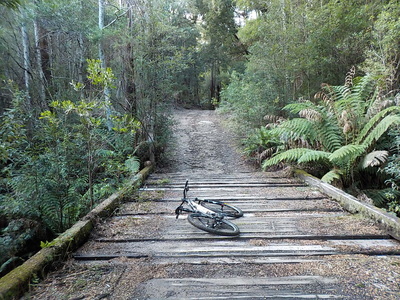 This trail can be ridden out and back (about 28 km) or 14 km one way if you shuttle. Course is mainly enduro style with very little climbing. 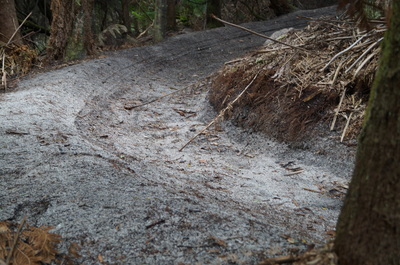 Black Dragon is a blue to black trail that could be very difficult if ridden with speed. It is a very tight trail that makes a relatively easy blue trail a little more difficult in places. See below video for more information. 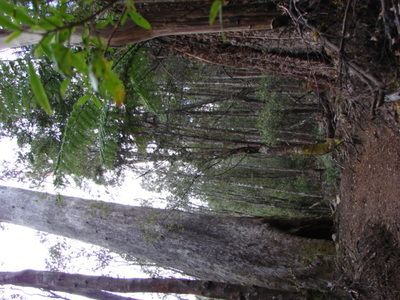 Big Chook is the last stage of the Blue Tier section of Blue Derby. It is the first section to open in the Blue Tier Reserve with the remainder to open by October 2016. Big Chook is a ripper 4 km descent with heaps of deep berms and jumps. The less adventurous can take b lines and roll over pretty much everything. To get to Big Chook, you can get there 2 ways. 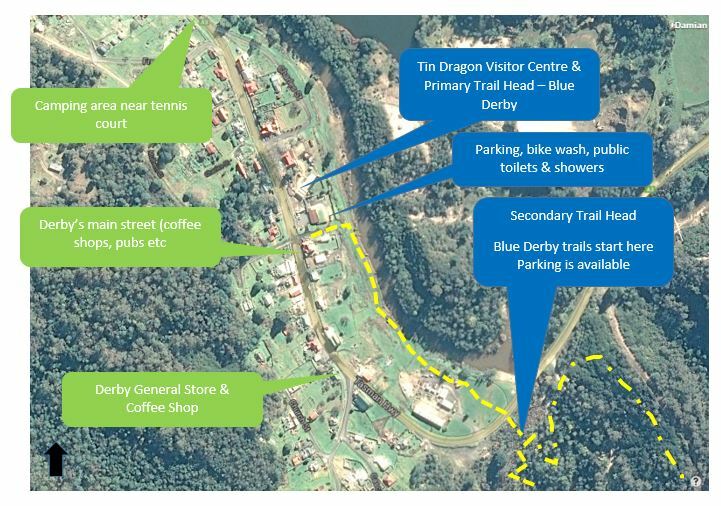 Directly via a 4 km ride from Weldborough Hotel or part of the Blue Derby Epic Trail. 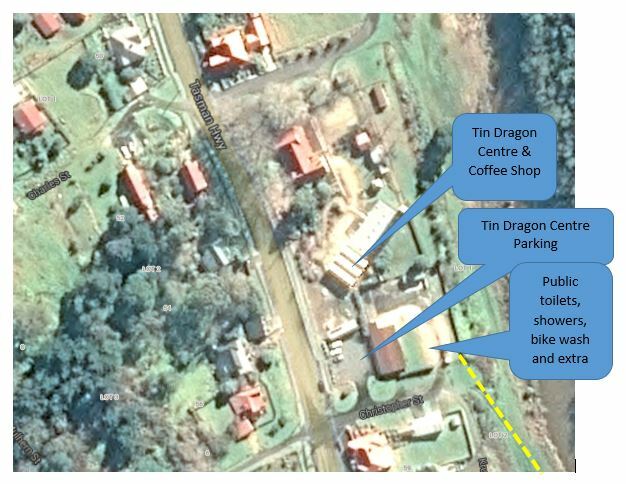 If you plan to just ride Big Chook, turn left straight after Weldborough Hotel and either park here (on left) or drive down 1 km to the bridge and start the 3 km climb up Emu Rd. At the top of the climb you are at Big Chook entry (turn right).